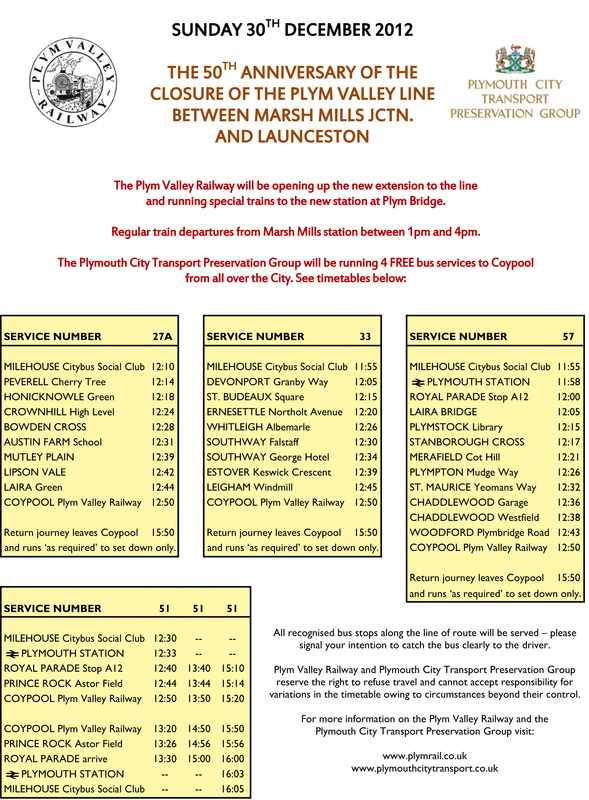 On the 30th, as you’re probably aware, the Plym Valley Railway open up their extension to Plym Bridge. The Plymouth City Transport Preservation Group are running free bus services to Coypool and I’ve attached the timetables in the hope you could promote them on your blog. A very enjoyable event that didn't actually finish until the evening with 2 runs of the class 50, the last being at 17:30. Will the line ever extend past Plym Bridge? One hopes so but with the total lack of support from all the local councils one doubts this. Plus of course the cycle track is now in the way. Still, this extension should be a major boost for the PVR which now actually goes somewhere at last. Anyway, a big thank you and well done to all concerned on the day including the PCTPG with their free buses.